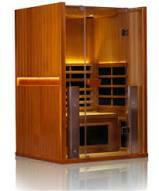 Dreamline saunas are mid-market saunas that give you some very nice features at a reasonable price. 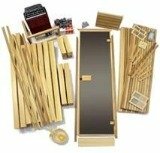 While they carry an impressive array of saunas in various sizes for both indoor and outdoor use, you won't find the higher-end luxury saunas offered by some other manufacturers who focus on the more expensive collections. This isn't a criticism; Dreamline fills a distinctive market. Middle class consumers who appreciate the health benefits and relaxation opportunities of saunas are investing in Dreamline products because they feel confident they will get a solid product without having to pay for expensive, unneeded bells and whistles. UPDATE: As of our latest review it appears that Dreamline no longer makes saunas, choosing to focus on showers and baths instead. Take a look at our top sauna brands for some good choices. 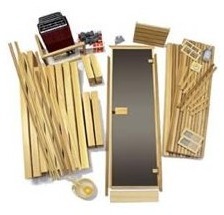 The top quality woods used for all Dreamline saunas are durable, attractive, and resist warping and splintering. European Alder is used for both the interior and exterior of indoor saunas. Red cedar is chosen for some smaller units such as their portable model and for outdoor saunas. One distinctive feature that sets saunas by Dreamline apart from midline price point competitors is the extremely durable and attractive tempered glass doors. You can order a variety of shapes and sizes that are fully framed and ready to install right out of the box (if you purchase a prefab to put together yourself). You can choose from clear glass, a soft, misty grey, or their most popular sheer bronze glass doors. Another thoughtful touch that you'll appreciate is the inclusion of duckboards with all indoor and outdoor Dreamline saunas. After all, if you're placing your sauna on a concrete pad, you don't necessarily want to walk on rough concrete. The wood duckboards are smooth and cool no matter what temperature the sauna reaches. 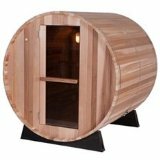 What Kind of Sauna are You Looking for? If you shop at Dreamline saunas, you won't have to shop around at other retailers to find the style and size sauna you've been dreaming of. Dreamline carries outdoor, indoor, pre-built, pre-cut and infrared saunas for those who prefer the warmth of a sauna without needing to pour water over rocks. The portable sauna is one of their best sellers because it comes in several pieces and can quickly be assembled in any room with waterproof flooring such as tile, cement, or granite. It's a compact unit that has enough interior room for two people to relax comfortably. 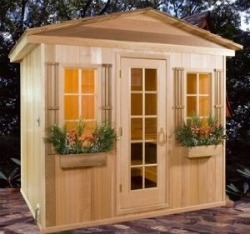 Delivered in two pieces with accessories, the portable sauna can easily fit through most standard residential doorways. You simply use their locking mechanism to join the two halves together. 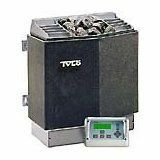 The sauna is pre-wired and ready to use as soon as you plug it into any standard outlet. If you're interested in a sauna but don't want to have to do a room remodel, add special wiring, or mess with complex specifications, portable Dreamline saunas are an excellent choice.